Happy St Patrick's Day to Irishmen everywhere. 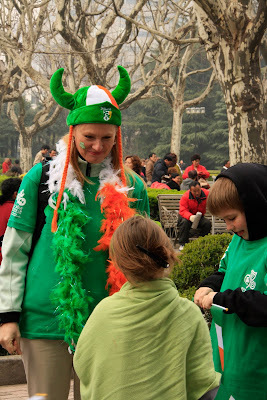 A surprisingly large number of people with Irish heritage live here in Shanghai and they all turned out for the St Patrick's Day Parade in Fuxing Park on the weekend. Or maybe they turned out for the stout. 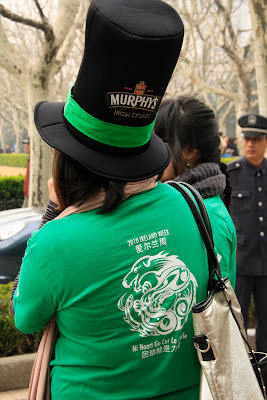 There was lots of green, white and orange and a sea of giant black velvet leprechaun hats, being given out by the Murphy's Irish Stout crowd. 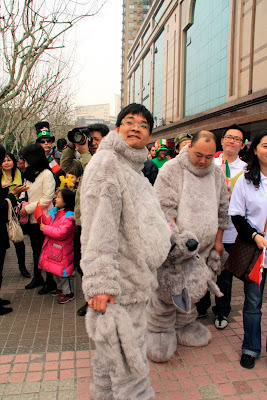 A marching band from the Shanghai Community International School led the way, there was Irish dancing, Irish music, a Chinese-Irish dragon, and 6 Chinese blokes in wolf costumes. I have no idea what that was about.